Argentine Voters Focused On Economy In Presidential Election : The Two-Way Inflation of 25 percent and hedge funds pushing for payment on bonds are problems the next president will face. 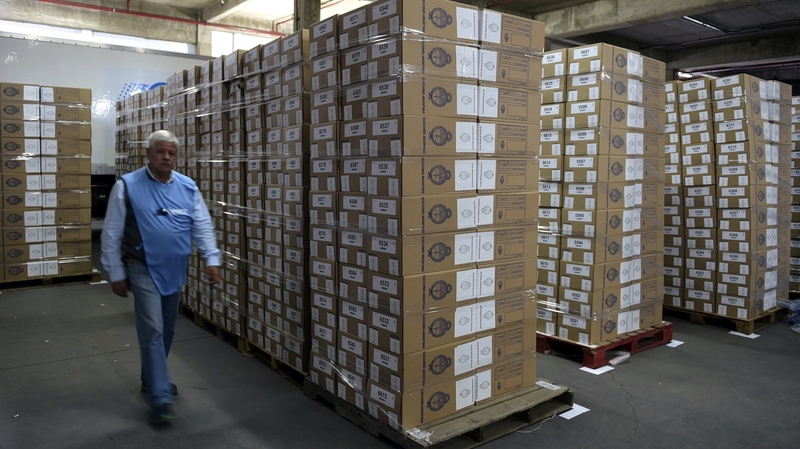 Members of the Argentine Postal Service walk next to ballot boxes for Sunday's general elections in Buenos Aires on October 23, 2015. Argentines go to the polls on Sunday to elect a new president, after a dozen years of being led first by Nestor Kirchner and later by his widow, Cristina Fernandez de Kirchner. There are three candidates in the race: Daniel Scioli, governor of Buenos Aires province; the mayor of Buenos Aires city Mauricio Macri; and Congressman Sergio Massa. To secure victory in the first round, a candidate will need to win 45 percent of the vote or 40 percent with a lead of 10 percentage points over the closest competitor. Polls show Scioli — who has been endorsed by outgoing President Kirchner — is poised for victory. The economy dominated the campaign. Inflation is around 25 percent and Argentina's currency reserves are dwindling. A major issue confronting the next president is whether to negotiate with hedge funds that own nearly $100 billion in bonds Argentina defaulted on in 2001. Kirchner, who is constitutionally prohibited from running for a third consecutive term, has refused to sit down with the so-called "hold out creditors," which, in turn, locked the country out of global lending markets. According to the New York Times, Scolio is expected to seek an agreement with the funds, led by the firm Elliot Management. The Kirchners' long reign was marked not just by economic populism, but also social progressivism. In 2010, Argentina became the first South American nation to legalize gay marriage. And under Cristina Kirchner, the government expedited justice for the perpetrators of the country's so-called Dirty War, during which thousands of Argentinians were tortured and murdered. The crimes were committed during a military dictatorship which ruled Argentina from 1976-83. Earlier this year, Argentina was rocked by the death of special prosecutor Alberto Nisman, who was found shot in his apartment on January 18, 2015. He was poised to testify before Congress that President Kirchner had tried to cover up Iran's orchestration of the 1994 bombing of a Buenos Aires Jewish center that killed 85 people. Kirchner said she believed disgruntled spies she had fired had been involved in the murder.